As mobile searches continue to grow, so does Google’s emphasis on the “mobile-first world.” To compete in this world, brands and businesses must be present in the micro-moment. The micro-moment sounds like fancy marketing jargon, but you’ve probably experienced three micro-moments today. We’ve all been there. Reaching for a mobile device for a quick search is second-nature these days. It’s critical that brands and businesses are there to answer users’ questions and needs in the moment. Ultimately, micro-moments are key touch points in the consumer journey, and, when added together, these moments determine how that journey ends. Not all four micro-moment categories will be applicable to all businesses. Still, there are a handful of PPC strategies that brands can and should employ to capitalize on these moments. Keep in mind that the best micro-moment strategies start with data analysis. Analyzing the data will help you identify why, where, and how potential customers search in the moment. Understanding their goals and desires will only help you better meet their needs. Imagine you need shampoo to clean that gorgeous, curly hair atop your head. Without hesitation, you turn to your phone to look for answers. In micro-moments like these, long-tail queries help users find exactly what they’re looking for. As a business, you’ll want to include these longer keywords in your PPC strategy—’what shampoo should I buy for curly hair’ or ‘best shampoo for curly hair.’ Although these long-tail keywords have lower search volumes, they often show higher intent and give businesses the opportunity to better meet their customers’ needs. This strategy goes hand in hand with long-tail keywords. Group long-tail keywords into distinct ad groups and write super specific ad copy for each ad group. This allows you to deliver ads and content that provide relevant solutions and answers to the questions your customers ask. In most cases, this personalized messaging will result in higher click-through rates and might have a positive impact on quality scores. This strategy can’t be overstated. Since micro-moments are typically happening on mobile devices, you need a mobile strategy to make the most of them. Make sure that your paid landing pages (and your whole site, for that matter) are optimized for mobile. Test mobile specific ad copy. Use AdWords’ Device Paths Report to figure out which devices are the most important touch points. Tweak device bid adjustments across all campaigns. Give call-only ads a shot. I could go on, but I’ll save it for another blog post. According to Google’s research, 90% of consumers who own multiple devices switch between screens to complete tasks. For this reason, it’s important to stay connected with your audience throughout the journey and across all devices. On AdWords, this requires using both display remarketing as well as remarketing lists for search ads (RLSA). Employing a combination of these retargeting strategies guarantees a strong brand presence throughout the multi-device consumer journey. Keep in mind, RLSAs also enable you to show different ad copy to return visitors. Take advantage of this golden opportunity and write even more specific and enticing ads. Have a brick-and-mortar store? Pore over your search terms and look for potential micro-moment queries. For example, during I-want-to-go moments, people frequently search the web with “near me” phrases. Be sure to incorporate these into your keyword strategy. Thanks to smartphones, micro-moments can happen anytime, anywhere. As businesses and marketers, it’s on us to be present for these real-time, intent-driven moments. So quit reading and get seizing. 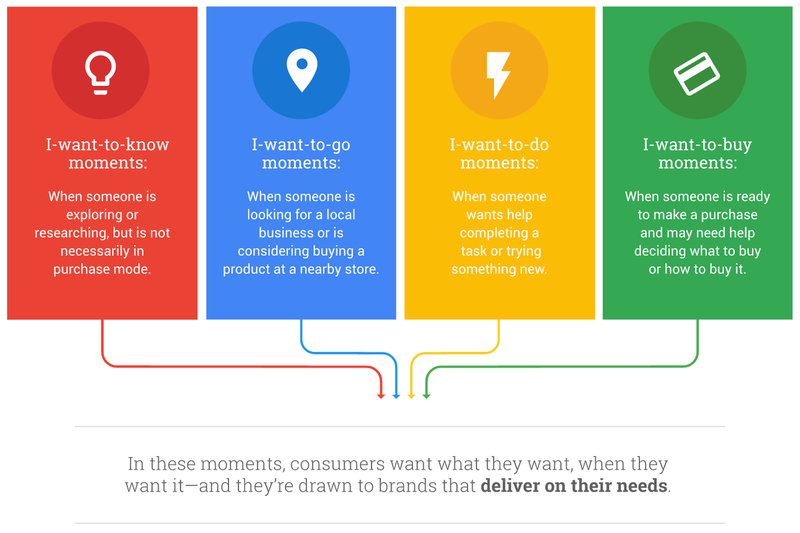 Have you mastered micro-moments? What PPC strategies do you use? Tweet us @Perfect_Search.